Unless you have been hiding under a rock, you have certainly heard the term “5G” on television as each wireless carrier tells you it is the fastest network ever! Simply put, “5G” is the next generation of wireless connectivity. It will make everything you do on your smart devices better. Better how? Well, let’s keep it simple and call it faster. By faster, I mean 50x to 100x faster than you get it today. As an example, if you were to download a movie on an iPad, it might take you 6 minutes today. Who has time for that, right? 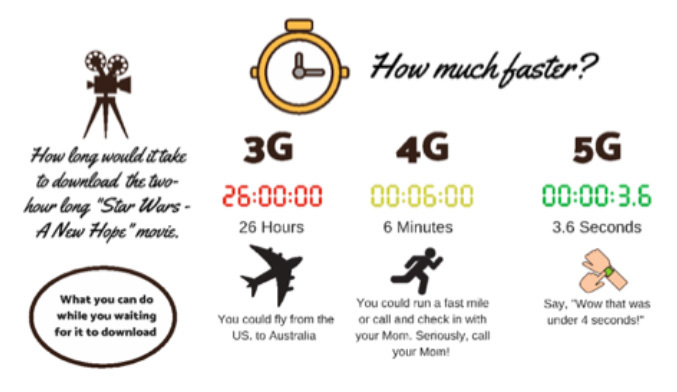 5G will accomplish this is less than 4 seconds! The second critical part of 5G is capacity. If you have ever been to an Ohio State football game at the Shoe and tried to get a signal, you understand! It’s not that there is no coverage within the stadium. The issue is there are 110,000 people trying to post pictures and videos on social media at the same time. It’s not a coverage issue, it’s a capacity issue. 5G is designed to solve most of the capacity issues. It is estimated that each cell site in the U.S. will need to simultaneously handle over 50,000 connections with 5G and the Internet of Things (IoT). Why do speed and capacity matter? In Evans Farm, that means ease of access to entertainment options that are happening in the town center or checking online for restaurant wait times. It’s a Saturday afternoon in the fall, and your favorite college football team is playing…and instead of sitting on your couch, you and the family choose to picnic in one of the many parks in Evans Farm. With 5G you can set up your iPad to watch the game in 4K HD as your spouse reads a book or just enjoys the sun. One of the most impactful benefits of 5G is the ability to self-monitor our own health in real time. If you wear a smart watch, you may see some of this today. Most of these benefits are recognized through “activity tracking” which can tell you how many calories you have burned or how many minutes you have or haven’t exercised. 5G can and will take these benefits to the next level, by warning you about a potential negative health event that may happen. Imagine getting a call from your doctor in real time inquiring about how you are feeling because they had an alert sent to them raising attention to an abnormality that is currently happening. This is extremely important for us as an aging population. The biggest reason why our older adults move from their homes is predicated largely by the growing need for ongoing health monitoring. If we use technology to help us self-monitor our own health, it gives us greater flexibility and longevity both in our independence and lifestyle. Robust wireless connectivity offers the ability to connect to emergency services such as police and fire departments. Today, over 70% of U.S. households are “cellular only”, meaning they no longer have a home phone line. This is important because the way emergency services find a location from a person calling from a cell phone is to “triangulate” the signal. Meaning, the emergency personnel are trying to find and confirm your precise location from the three closest cell towers to which your phone is connected. Sometimes, these cell sites could be located miles away. 5G requires much smaller, but higher numbers of node (cell) locations that are integrated into our communities. Overall, what 5G will allow is real time access to information and the ability to use that data to live our lives in the most efficient way possible. Families residing in Evans Farm have one of the best school systems in the state with their children attending Olentangy Local Schools. Daily, teachers ask students to access information from their devices to find answers to problems. Our schools are able to create real-time surveys or tests for the students to take or respond to using their smart devices. So, what does all of this speed and access to information truly mean? Within Evans Farm, this will help with keeping the community safer with access to information and entertainment options. All of this while being integrated within streetlights or on building with as little visual impact as possible. It will be there when you want it and hidden when you don’t. Christopher Bland is the Founder of Cell Site Capital based in Columbus, Ohio. Since 2013 Cell Site Capital has helped communities develop responsible wireless services. Focusing on integrating communication facilities with minimal impact to the community. We are pleased to announce that, at the time of this printing, we now have 10 homes under construction! Construction is proceeding in our Phase 1 residential area. Fiber-optic, natural gas, and electric lines are currently being extended through the alley corridors of the community. Preliminary plans are being reviewed on the initial phase of our commercial area. We are optimistic that, following plan reviews and permitting, construction will begin in the 4th quarter of 2018. We recently held the Evans Farm Tree Sale, with trees grown from our nursery stock. We enjoyed meeting with many of our neighbors in the community and were able to sell a number of trees. Proceeds from the tree sales were donated to the Evans Farm Foundation. We have begun the process of moving our nursery, currently located near Radnor, to our new site at Evans Farm. We are moving over 3,600 trees! Our new location is at the corner of Shanahan Road and North Road. Look for the old red horse stable, it’s our new nursery! Over 400 people enjoyed the Grand Opening Event at Evans Farm on May 6. Those in attendance were able to see the new homes that are under construction as well as meet with the staff and representatives from the preferred custom builders. There were also food trucks, face painting, balloon artists and recreation and pony rides provided by the Y. Sunny 95 was also on site to give away prizes and play music. The weather was fantastic and it was a great opportunity for those interested in the Evans Farm community to learn more about this exciting community. Each year, in the Olentangy Elementary Schools, a week is designated to teach the first graders about the sciences and life skills. The teachers and volunteers schedule guest speakers to come into their classes and coordinate activities with their students. After speaking with a few of the students in one of the schools, some of the guest speakers they had this year focused on yoga, rocket launching, karate, and, of course, Evans Farm trees. In one of the classes, we even stood up and did the yoga tree pose for a few minutes. At Heritage Elementary, the first-grade students planted Chestnut Oak acorns earlier in the year (see January/February 2018 newsletter). After that activity, the Evans Farm staff brought the potted acorns back to the greenhouse to allow them to grow in an ideal environment. During that time, the acorns were given warmth, sunlight, water and fertilizer. The tree saplings were returned to the students during the Camp Skeeter presentation. The saplings ranged between 6-10” tall. An additional presentation was made at Johnnycake Corners Elementary School. These students were each given a Burr Oak from the Evans Farm greenhouse, with hopes and expectations that they will get planted by the students. How does a tree change carbon dioxide into oxygen? How many types of trees are there? How could the oldest tree be almost 5,000 years old when it is only 2018? When do trees make bark? Evans Farm appreciates being able to partner with the Olentangy School district and looks forward to coordinating with Arrowhead Elementary during their “Survival Training” during the month of June!